For the past five years, professor Chung Woo Thak from Dongguk University in Seoul, Korea and professor Tsunenori Fukushima from Hanazono University in Kyoto, Japan—together with their students—have traveled to Hawai‘i twice a year to research the paintings in the Richard Lane Collection. 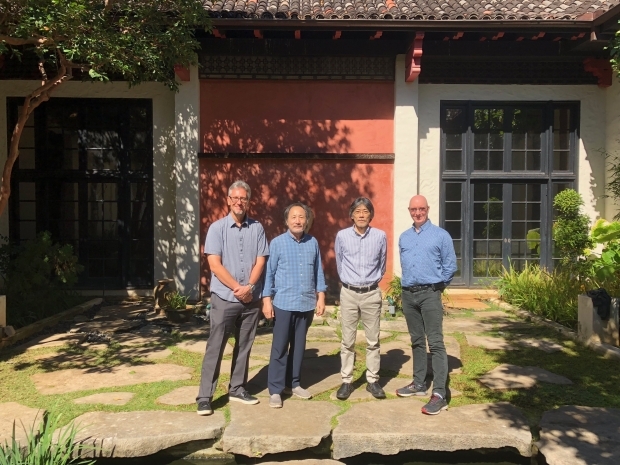 The two are experts in their respective fields (and also lifelong friends—they attended Kyushu University together) and are the first outside scholars to dive deep into the paintings of this trove of Japanese, Chinese and Korean art. They have identified many exciting surprises—previously unknown treasures and rare, centuries-old works by artists who are sometimes little known today due to the scarcity of their surviving oeuvre. In February the two scholars made their ninth trip to the museum. At this end of this session, they have now gone through about 1,200 paintings, or half the collection. To mark the milesone, the HoMA blog caught up with them to see how the research is going. Editor’s note: This interview was translated by Kiyoe Minami, Robert F. Lange Foundation Japanese Art Research Assistant, and edited and condensed for clarity. Curator of Asian Art Shawn Eichman is also included in this interview. Chung: We have to focus on being accurate because it’s the first time these paintings have been researched. We don’t care about the speed, it is more important that everything is identified correctly. We have finished surveying just about half of the collection, but nobody knows how long it will take to complete it. Fukushima: The Lane Collection is especially challenging because it has a wide variety of artists, periods—everything—from Japan to China and Korea. Chung: The collection is so extensive, it will likely take more than one generation to complete all the research that needs to be done. Eichman: The breadth of the collection means that multiple people with multiple specialties are required to do a full evaluation of it. We’re working with several different groups on different aspects of the collection. For example, in addition to Professors Chung and Fukushima who are surveying the paintings, we’re also working with the National Institute of Japanese Literature and a group of scholars organized by Kyushu University to research the books. Why are you dedicated to researching the Lane Collection? Chung: Our ultimate motivation is to see the artworks on display in the galleries, and to make the public aware of what a tremendous resource the Lane Collection is. Fukushima: Even compared to museums in Japan, the Lane Collection is unique. It is remarkable to be able to see such a wide range of artworks in a single collection. Usually, if you want to get a full picture of the art world in Japanese history, you need to draw from multiple sources, and each institution only has one or a few areas in which it specializes. In the Lane Collection, though, you can learn everything in a single place. We’re always surprised by the paintings we’re discovering, and there is so much potential to do exhibitions on so many different subjects just from within the Lane Collection itself. Eichman: There are paintings by famous artists, and there are paintings by obscure artists for whom there is little documentation. The opportunity to see paintings by the latter is almost unheard of, so even someone like professor Fukushima, who has dedicated decades of his life to studying Japanese painting, will find dozens of paintings by artists he has never heard of during each trip. It’s a real opportunity for them to learn new things, which is something that’s rare in museum collections. What are some of your favorite discoveries? Fukushima: This 14th-century Chinese ink scroll of the Bodhisattva Avalokiteshvara in a white robe (shown below). Fukushima: The value of this painting alone is worth more than the entire amount of money the museum has so far invested in the Lane Collection. The time period in which it was made is especially interesting for Buddhism, and there were big changes happening in Buddhist art in China. It was also a time when Japanese monks were traveling to China to learn more about Zen Buddhism, and bringing news about these changes back, so the painting is significant for understanding more than one culture. Chung: This 16th-century Korean scroll documenting an important gathering of scholar-officials (shown below). Eichman: This scroll is incredibly rare. Even in Korea, there are only a handful of examples from that time, or of this subject, that survive. There was a devastating invasion of the Korean peninsula by Japan at the end of the 16th century, and so much was destroyed that the few artworks to survive all have a special place in history. 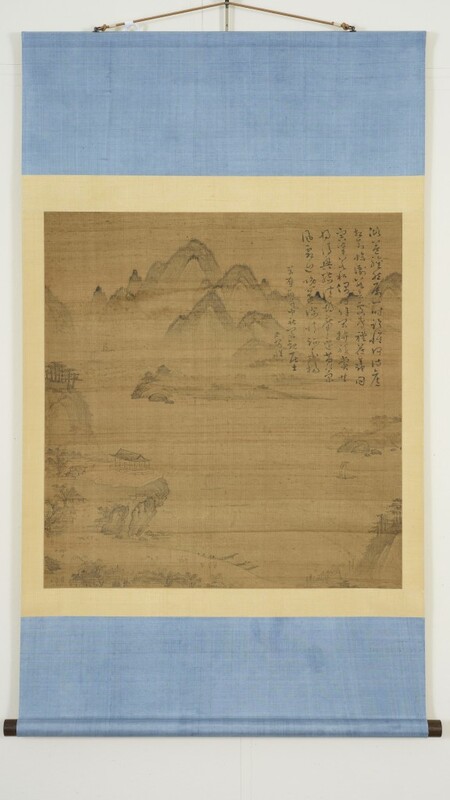 This painting was conserved with support from the Korean government thanks to Professor Chung, who became aware of the Lane Collection when he came to the museum to do a survey of Korean paintings. In fact, it wasn’t even identified as Korean when it entered the museum, and it was Professor Chung who first discovered its importance. I have been intrigued by the story of the Lane Collection since learning about how it was acquired in an article by (or interview with) former director Stephen Little. Kudos to him for his role in bringing the collection to the museum.